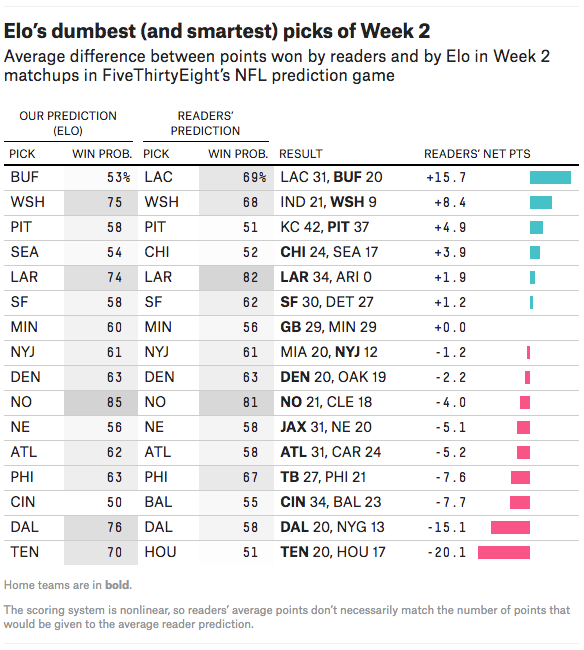 The Kansas City Chiefs are off to a hot start, as are some of you who are participating in FiveThirtyEight’s NFL forecasting game. Week 3 is now upon us: The Jets and the Browns face off tonight at 8:20 p.m. Eastern time. It’s time to take a break and submit your picks. 🙌 Alexandre Augusto da Rocha was at the top of our Week 2 leaderboard, coming in at second place with 170.0 points (his was the highest score among players who have shared their names publicly on our leaderboards). 🏆 Alexandre, with 222.6 total points, is also second on our overall leaderboard. FiveThirtyEight’s Elo model is in 1,793rd place with 44.7 points.